Lots of things have changed in the last 10 or so years. But most importantly our customers have changed how they behave and employees have changed how they feel about their work. For sales leaders we can no longer take financial budgets and use it as a the basis for managing a sales team. Challenging targets and internal competitions are the way of the last century and no longer work. Leading sales teams is a balancing act. It is about getting the right balance across all the elements of leading sales teams and keeping it in harmony with the Customer Strategy. To get our heads around these ideas let’s use the metaphor of a wheel. The hub is the Customer Strategy and the elements of leading sales teams are around the hub. The Wheel of Leading Sales Teams. This model is based on systems thinking, and the sales leader needs to ensure each of these functions are in balance across the wheel. The Wheelis only a sequential process on the first implementation. Your Customer Strategy is at the centre and remains the central hub of all the activities of the sales team. The objective is to deliver the results needed for the customer strategy. This takes us away from product flogging and towards growing profitable customer portfolios, full of advocates of what we do. Coaching is a key part of the role of the sales leader which directly links to the motivation of individuals and teams. Problems sales leaders face are often reflectedacross the Wheel. For example, if you have the team organised as Account Managers and they are regularly visiting existing customers, but your remuneration model is one that is better suited to roles that need to find customers, then you will see problems in the motivation and productivity areas. Leaders often then try to fix these perceived problems with motivation and productivity solutions. But unless they address the root cause problem, they will make the problems and symptoms much worse. At the hub of the Wheel is the Customer Strategy. The Customer Strategy is an articulation of the results of the business strategy in the context of how this is achieved through your various customer groups. The Customer Strategy will inform the direction and success of the sales team. By focusing on customer groups rather than products the sales team will contribute to building long term profitability for the business. Once the Customer Strategy is in place, the sales leader can then direct the sales team towards this aligned approach. The sales tactics are about finding the optimal way to deliver on the Customer Strategy. The key here is alignment. So much of sales practice is left to individual sales people and what they feel is the ‘right approach’, based on their experience, rather than the sales tactics being designed to achieve the desired outcome. Recruitment then is based on the types of people needed to deliver on the sales tactics as well as the values of the organisation. The values and beliefs of the candidate is the best predictor of future behaviours. Skills and capability are important, but they can be learned and getting the right person is the critical part. Industry knowledge is often over rated, recycling sales people through a particularly industry does not create a point of difference. In a B2B context the people that can best empathise with customers, are the people that once were customers. It might seem a given that the sales leader needs to continually focus on the development of the skills and capability of the sales team. However, in the fast-paced, all-too-busy business world, many sales leaders neglect to realise this need of their team. Not only in terms of induction and on-boarding, but also from an individual, ongoing, one-on-one coaching perspective. The remuneration system is a motivational hygiene factor, if the sales person feels well remunerated then they get on with the job at hand. However the remuneration system needs to guide the sales people towards team-harmony, with a clear focus on the customer and their results. Sales leaders need to design the remuneration system that best meets the needs of the sales person and the business, that delivers the required balance of motivation, quality and productivity, retains the top performers, and attracts quality candidates from the market. Sounds easy..? Approach it from the point of view of getting a balance across all these factors. Refers to how the customer engagement (sales) function comes together. Do you need appointment setters, marketing coordinators, analysts, and ‘inside’ team and an external (outside) team..? The goal of organisation is to remove any constraints that prevent the team achieving its goals. For sales people administration tasks need to be reduced to a minimum as they will always form a detraction from the strategy. Many sales management approaches focus on increasing customer-facing time, which is great but in many contexts this needs to be balanced between customer account analysis and customer contact just for the sake of it. The objective of sales force design is to maximise the resources available on the optimal activities. A large portion of the sales leaders time needs to be focused on coaching individuals for performance. This is managing performance, but when the focus is on coaching there are flow on effects for motivation and the effort on specifically managing individuals on performance will be reduced. This is based on the Triad of the Emotional Contract (read more here) which links into the research into what drives intrinsic motivation.. The model is best implemented through having regular one-on-ones with each team member. 20-30 minutes every two or three weeks, it is the frequency that makes this work. This is a big topic and is discussed in more detail in the whitepaper on The Balance of Sales Leadership (access it here). In short, when the research is reviewed and applied to the sales context we find the following. Alderfer’s ERG theory is very useful. Existence needs are about the desire for physiological and material wellbeing. The need for relatedness is the desire for satisfying interpersonal relationships. Growth needs are concerned for the ongoing personal desire for personal growth and development. And the needs are concurrent, unlike Maslow’s model which suggests the needs are sequential. The two top motivating factors for sales people are; 1) individual meetings with supervisor to discuss career, job problems etc; and 2) Regular accompaniment in the field by the sales manager. Goal setting needs to be done collaboratively. Goal motivation depends on the commitment of the individual to the goal, their self-belief that they can achieve the goal and the support they receive to progressing towards it. A sales leader that is focused on coaching for performance will trigger supported motivation for the team member. Additionally, sales managers often see sales competitions as a quick fix for KPIs and motivation. However, competitions trivialise the nature of teamwork and creates more losers than winners. Competition needs to be external not internal. Misalignment is what happens when sales leaders depend on sales competitions to motivate the team. They rupture relationships within the group, foster poor sharing of information, perpetuate distrust and more often than not, encourage gaming of the performance measures. Problems that will present as symptoms across the Wheel. If we must have sales competitions, then let’s ensure we have a focus on building teams, on developing skills, and creating many more winners than losers. Another big topic discussed in more detail in the whitepaper on The Balance of Sales Leadership (access it here). To me the shorter version is to triangulate the three components of a forecast or plan. The Sales Force Micro Plan – this is the bottom up approach. Looking at existing and potential customers, current capacity and plans what could be achieved. Balancing this is the expectations from the broader organisation and the goals, targets of other interdependent functions (such as public relations, marketing, customer service). And also considering the potential of what could be achieved if things changed. Particularly in consideration of where we may want to go and what then could we achieve..? 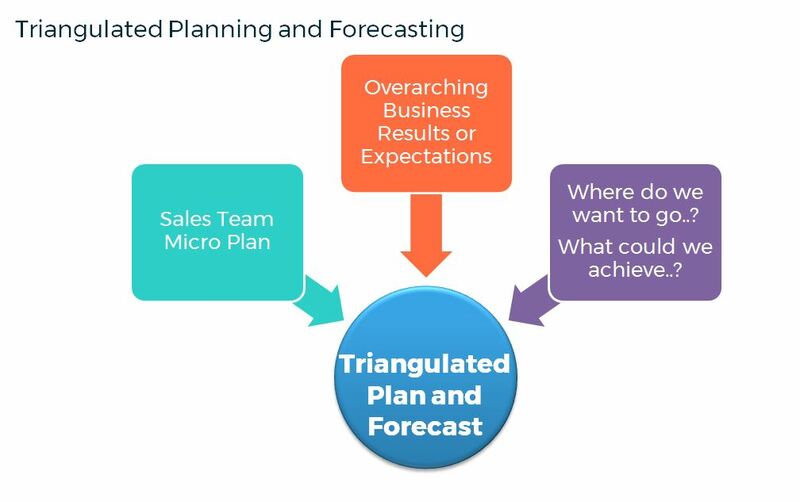 Triangulating these three components should produce a solid forecast and plan for the sales team to work towards. The sales leader can also use the forecast and plan to help obtain buy-in and engagement more broadly across the organisation and develop shared goals and collaborative planning with other functions. The Wheel of Leading Sales Teams outlines the key functions of the system that is made up of parts, with people being the connector across all parts. How this system of sales all comes together – and operates in balance – is the key to the understanding how the results are achieved by the selling activities of the business. This understanding then enables the sales leader to fine-tune and continually improve the customer engagement system to achieve the Customer Strategy. However, sales managers often get addicted to fixing symptoms rather than addressing root cause problems which in turn causes more symptoms to fix. The role of the sales leader is to ensure the wheel is in balance, to align resources and maximise the achievement of results.